Located on De Bleury Street in the enticing International District, style and luxury make this fully-furnished 550 square-feet, studio loft a true cosmopolitan experience. With its industrial elegance, factory-style fenestration and the finest amenities, guests are ensured a comfortable V.I.P stay. This full-furnished unit is open-concept and embraces the urban lifestyle with minimalistic aesthetic and modern finish. European-style kitchen is fully-equipped with high-end appliances and features fitted cabinets, new materials and a breakfast counter. Guest can entertain with a four person dining table, a comfy den area and the original factory fenestration gives unique views of the city. This studio loft holds a queen-sized memory foam mattress and streamlined armoire as well as ultra-modern bathroom, completed with a luxurious walk-in rain shower and counter-mounted vanity. Big city living at its best, Montreal has never looked better! Built in 1916 for Southam Printing Incorporated, Southam Lofts truly represents the industrial history of another time. While initially constructed to hold massive printing presses, the structure itself was built with distinguishing architectural components including windowed corridors, ornate carved stone details and Art Nouveau tower façade. Completely refurbished and modernized while keeping true to its original, industrial character, amenities include a state-of-the-art gym adjacent to the main lobby, a fully-equipped multifunction room complete with full kitchen and multimedia section, common rooftop terrace with views of the river and fireworks as well as a garden courtyard. The building also features three ultra-modern elevators strategically placed throughout the massive construction and key-card access, video surveillance and alarm monitoring for added security. 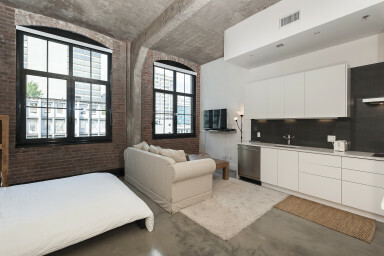 This loft studio for rent at Southam Lofts is serviced by the Square-Victoria metro station. This area is known as the International District and it is where the city’s major banking and business centres are found. This particular address was once a prominent paper mill and shares the heritage site protected by the nearby St-Patrick’s basilica. Ideally located between the downtown core and Old Montreal, the International District benefits from easy accessibility to work and play in an architecturally rich environment. The colourful Palais des Congrès gives direct access to Montreal’s Underground City including Place Ville Marie, Central Station and Old Montreal. Guests will also find close proximity to the Place des Arts, the Museum of Contemporary Art and the Quartier des Spectacles where the city holds its annual international festivals and celebrations. For unique urban landscaping and don’t forget Chinatown, the International District is truly an exceptional neighbourhood!